Hidden down a narrow lane off an old cemetery in Bloomsbury, two prominent collectors Frank Cohen and Nicolai Frahm have opened a new public, non-profit exhibition space this summer called the Dairy. 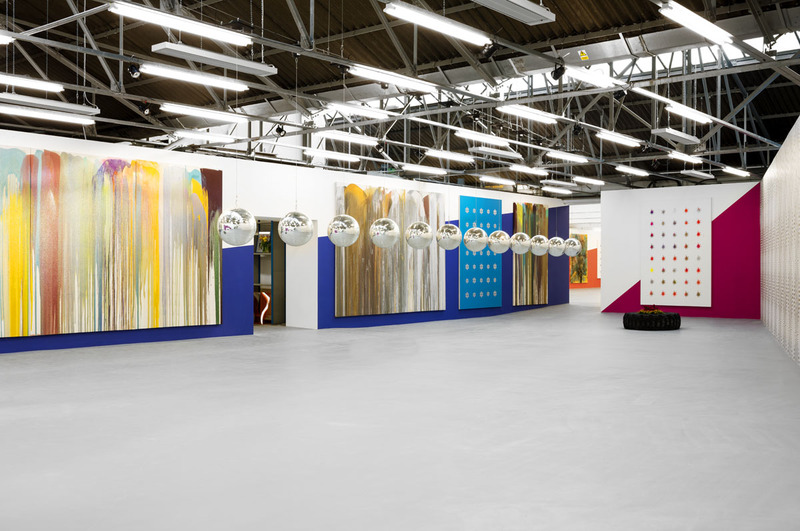 Named for its former role as a milk depot, the cavernous warehouse lends itself well to the type of large-scale work and installations on show in this opening exhibition of work by the Swiss artist, John Armleder. He is associated with the improvisational and performative Fluxus and rejecting institutional or commodified art. Armleder is instinctively transgressive. Wallpaper and painted walls compete with hanging paintings made by splashing and pouring paint, resin and glitter across canvasses. This is not the intuitive expression of Jackson Pollock or the formal experimentation of British Painter, Frank Bowling, but an attempt to challenge that urge we have to categorise art in order to seek some certainty. Armleder is an active curator of his own exhibitions and this is evident at the Dairy. He enjoys mixing the work up so that aspects of interior design muddle the distinctions. Walls are painted with stripes and 12 disco balls (Global Tiki, 2000) hang from the ceiling in a diagonal progression across the gallery. Plants sit within makeshift beds made from old tyres that replicate planting in the yard outside. Boundaries collapse and the gallery becomes a theatrical set in which viewer becomes performer. In the ‘fridge’, Armleder has built an installation from metal shelving stacked with bric-a-brac of lava lamps, old framed photographs and stuffed animals. The explicit absence of good taste here touches on the perilous territory of class and caste. But the universal interest lies in the suggestion of domestic accumulation of stuff that threatens to physically overwhelm us. Objects also potentially carry memories and aspirations. On a sound loop, grating Hawaiian music plays its kitsch melodies as if we are stuck in Honolulu airport. Armleder also piles up old art books and magazines in a messy heap. Culture and human achievement are reduced to a stack of discarded rubbish. But it uncannily echoes that desire for distinction between what’s valuable and what’s junk. Who hasn’t struggled with that dilemma? Ultimately, everything within this installation begins to resemble a flea market of the redundant, creepy and worthless. There is the hint of mothballs, the charity shop and the hoarder. Such a critique of materials and their associations is most explicit in a work that curls out across the floor merging metal shavings, wood logs, bowling balls, art books and sand. Comprising both the raw and the manufactured, these elements suggest formlessness and precision, functionality and waste. The pliability of materials and their myriad uses embody the spectrum of human activity but seem dumped on the floor as a levelling gesture. Perhaps the most puzzling works are paintings made from simple, repetitive designs like spiders or flowers, resembling stickers or potato prints. Paradoxically, made by the artist in a painterly process, at the same time they suggest a universal, graphic language. In the entrance sits one of the artist’s ‘Furniture Sculptures’ a fashionable looking lacquered bar top with stools covered in various ‘lollipop’ colours. Imitating high-end design, the ‘sculpture’ doubles up as counter you might find in a fashionable bar, but the piece maintains Armleder’s frustration of clarity – for most of the time it is an inviolable sculpture to be gazed at. Armleder’s work is intentionally provocative and wilful. Formally diverse and inconsistent, the exhibition conveys the playful intentions of an artist first emerging from the 1960s. Conceptually, the work is quite robust as Armleder consistently resists a singular ‘style’ or subject. He quotes art history while turning materials and objects upside down. Irresolution is the prevailing theme. You’ll discover an exhibition packed with subversion, where teasing contradiction becomes a value in its own right.